The on-premise contact center or legacy contact center, is based on inflexible and proprietary platforms from vendors such as Cisco, Avaya, and Genesys. McGee-Smith Analytics estimates that approximately 85% of contact center agent seats are still supported by on-premise solutions. On-premise contact centers require custom hardware and software deployments. These types of solutions provide customizability, integrability, reliability, and some amount of scale, but are expensive and difficult to deploy. The customizability benefits of these contact centers can only be realized when companies invest heavily in professional services or a small subset of developers who are trained on the platform. With on-premise contact centers, deployment can take 7-24 months and every change takes nine to twelve months. This infrastructure wasn't designed to keep up with disruptive changes in consumer behavior. Many on-premise systems are running on outdated data technology and infrastructure. This underlying technology impacts systems reliability, performance, and security, which is why so many businesses are migrating to a modern alternative. DMG Consulting predicts that the number of seats in cloud-based contact center infrastructure will grow by 22.5% in 2018, and 23% in both 2019 and 2020. Most legacy contact centers haven’t aged gracefully. Inflexible, expensive contact center infrastructure can’t scale or adapt to evolving customer expectations and digital innovations. With mounting operating expenses, there’s little room to re-invest and improve the on-premise contact center. The end result is often a poor customer experience, which can be devastating to the business. 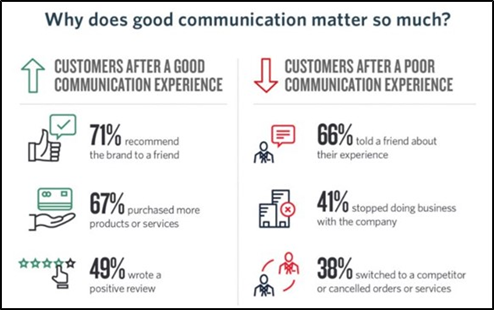 66% of respondents to the 2017 Customer Communications Report tell their friends about their poor customer experiences. In addition, on-premise license fees are expensive. Further still, annual maintenance can end up being between a quarter of the license cost while changes to the system, such as adding a new channel, are often so expensive they are effectively impossible for businesses to make. Specialists trained in on-premise systems are becoming harder to find and hire. As a whole, it’s overpriced to run an on-premise contact center requiring heavy virtual machine power and gear for a high availability solution. Fortunately, there’s finally a modern answer to this legacy problem in the cloud contact center. Many companies are frustrated with their on-premise solutions that have aged out and are looking to start over. Companies looking to enhance and adapt their existing contact center solutions are typically looking to do so in one of two ways - augment or replace. If they are looking to augment, they typically want to integrate additional functionality or channels using Twilio or another cloud-based product into their existing contact center system. Other customers want to replace their contact center experience from the ground up to better meet the exact requirements of their business. Software as a service (SaaS) solutions are software solutions that businesses purchase on a subscription basis. Contact Center as a Service (CCaaS) providers offer hosted contact center software, maintaining the servers, databases, and code. Customers access the center via the internet and pay for its use on a subscription or pay-as-you-go basis. These products offer limited customizability but are relatively quick to setup and install. Unlike with an on-premise contact center, the customer must provide their own hardware. API-based companies like Twilio offer a third option that give customers the flexibility of an on-premise solution with the speed of deployment and ease of use as a SaaS solution. Building with pay-as-you-go APIs is orders of magnitude cheaper than even just the annual maintenance costs of on-premise contact center platforms. These APIs enable agility in business processes, resilience in deployment, and drastic cost savings. For companies that don’t want to build their own contact center with APIs, and who find a CCaaS option too inflexible to their changing customer and business needs, there is another option. Contact center platforms like Twilio Flex enable companies to build at unprecedented speed while customizing a unique design for their specific customer and business requirements. Although Twilio Flex is more intuitive than building with APIs, it’s still an open platform meant for custom software development rather than a completely out-of-the-box solution.